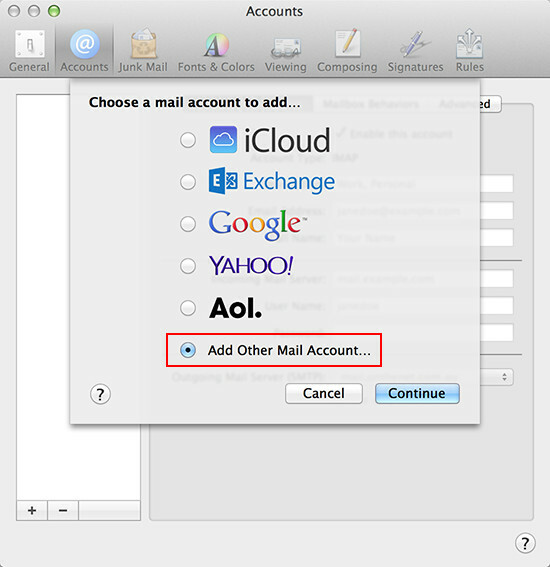 The following email setup guide is for Apple Mac Mail versions 1 - 9 only. 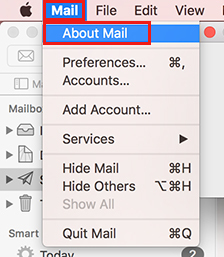 To check what version of Mac Mail you have, open up the program and click the "Mail" menu and then select "About Mail". 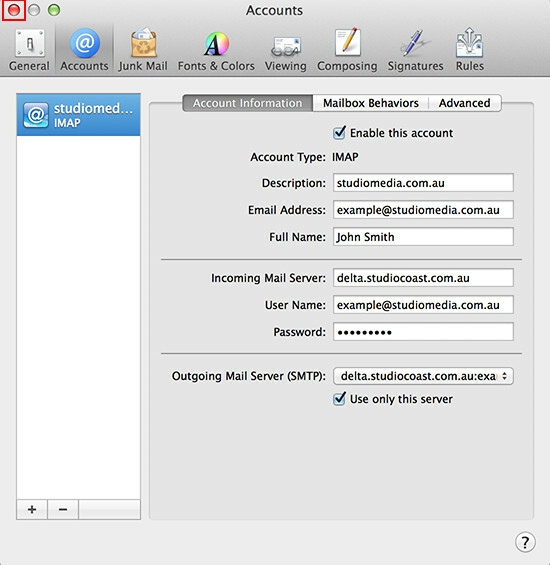 If you have version 10, click here for the Mac Mail version 10 setup guide. Open up Mac Mail (which is the stamp icon with the eagle). Select the "Mail" menu from the top and then select "Preferences". 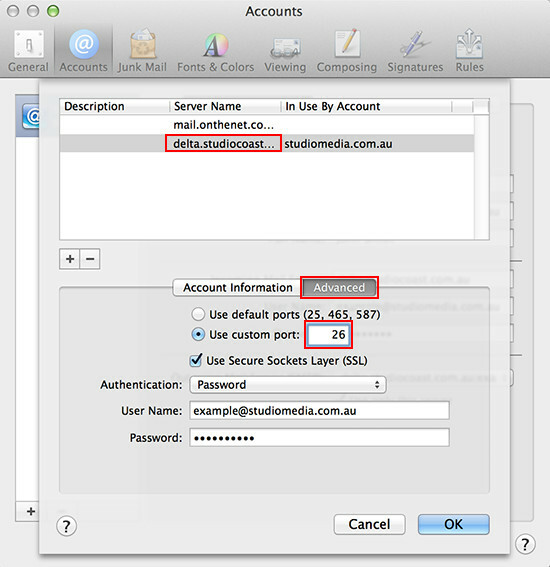 In the Account window that pops up, select the "+" button in the bottom left hand corner to setup a new email account. A new window will appear. Select the option "Add Other Mail Account..." and click 'Continue'. You will asked for your Full Name, Email Address and Password. Once completed, select 'Create'. It will then tell you the Account must be manually configured. Click 'Next'. 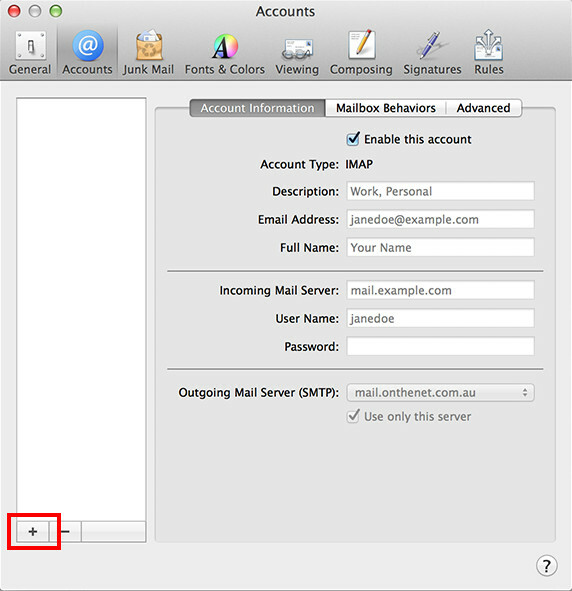 Next, fill in your Incoming Mail Server Info as below. Once completed, select "Next". 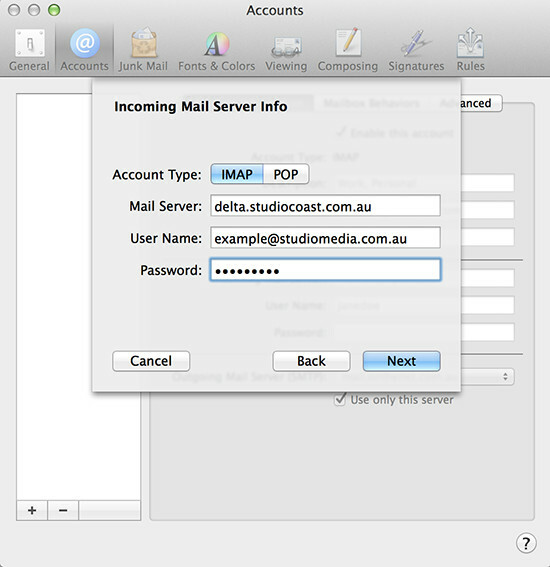 Account Type: Select POP or IMAP. If you are unsure which to choose, see the following Knowledge Base article link on Should I choose POP3 or IMAP?. 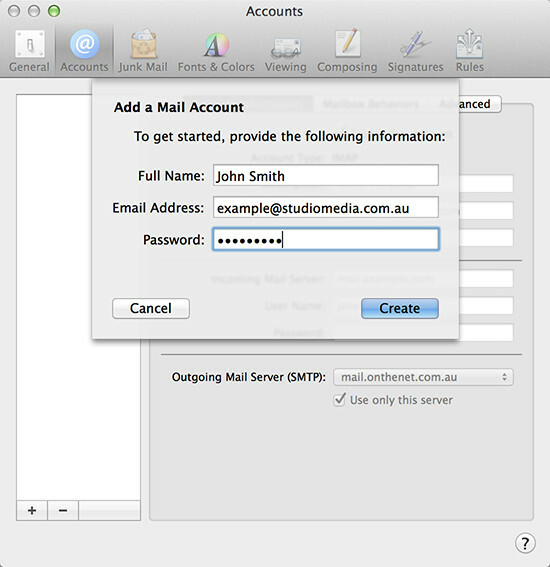 Incoming Mail Server: Your email account's incoming mail server. To find this, please refer to your Account Information by logging into hostControl. The next window will show Incoming Port and Authentication. The incoming port will be set by default and doesn't need to be changed. Using SSL is optional. The authentication should also already say 'Password'. Select the 'Next' button to proceed. (This will only show up the first time you setup an email account for the same domain). You will now be asked to enter in your Outgoing Mail Server info. This will exactly match your Incoming Mail Server Info. Once completed, select 'Create'. This will now bring you back to the Accounts windows. 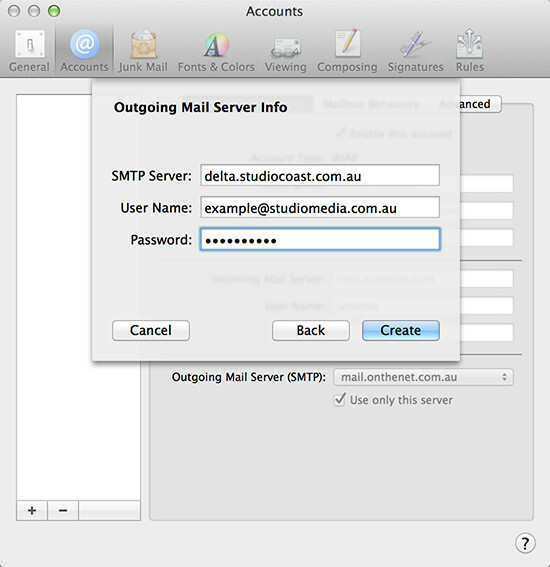 Next, select the Outgoing Mail Server dropdown menu. 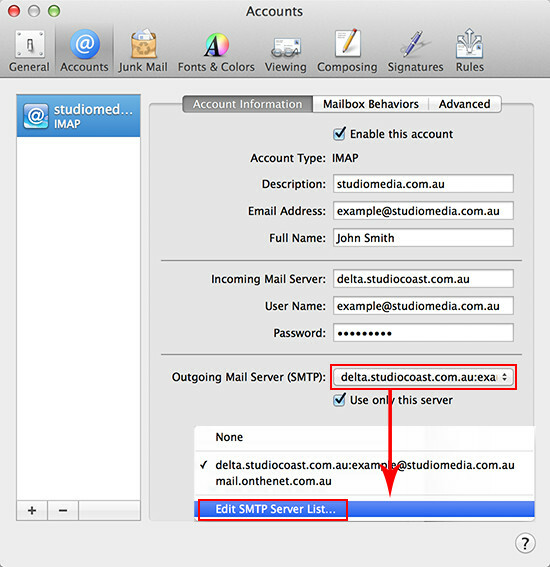 Then select 'Edit SMTP Server List'. A new window will appear. If you have more than one email account setup, ensure you have selected the correct one from above. Then select the "Advanced" tab. Check the box "Use custom port" and change it to 26. 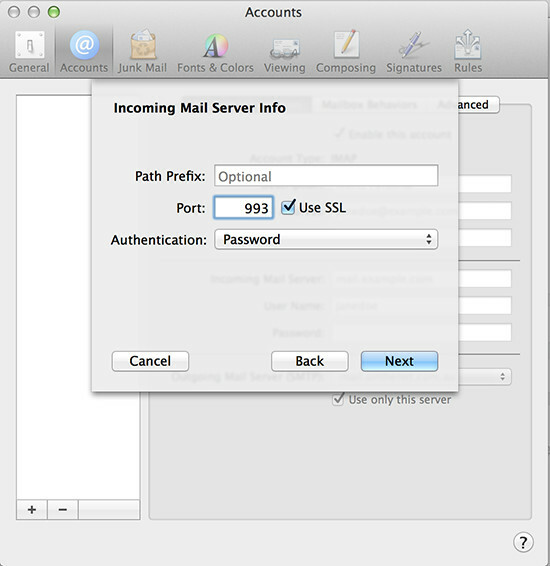 Other versions of Mac Mail may not have the use custom port and instead you should just be able to type it into the port field. Click 'OK' to save. Your email account is now setup and ready to use! Select the red x in the top right hand corner to close the Accounts window. If you happen to see a circle with a jagged line through it next to your inbox, click it and then select "Take All Accounts Online". This should bring your email account online. If this doesn't work, you may need to restart your Mac computer.